Kerplunk! is the second full-length album by punk rock band Green Day. It was released on January 17, 1992 on Lookout! Records.Kerplunk! was their last release on an independent label and was also the first album to feature their current band lineup, with Tré Cool on drums. The album went on to become one of the bestselling independent albums ever, selling 10,000 units on the day of its release. Major labels took notice of Kerplunk! 's phenomenal popularity and many approached the band. Green Day realized that they had outgrown their record distribution capacity with Lookout! and eventually signed with Reprise Records. With Reprise, Green Day would record and release their third album Dookie (1994). The album officially includes only 12 tracks, but the versions released on CD and cassette also include the 4 tracks from the Sweet Children EP. One of those 4 tracks is a cover of The Who's "My Generation". Another notable track on the album is "Welcome to Paradise", which the band would re-record for their next album Dookie. As of November 2006, Kerplunk! has sold 699,001 units in the United States, and over 4 million worldwide.In August 2005, Green Day pulled this album, as well as all of their other material released through the label, from Lookout! due to unpaid royalties. It was reissued on CD by Reprise Records, who Green Day has been with since leaving Lookout!, on January 9, 2007. Note that in Europe, the album was released by Epitaph Europe, and has remained in print. It was reissued on vinyl on March 24, 2009 by Reprise Records and includes a reissue of the Sweet Children EP. 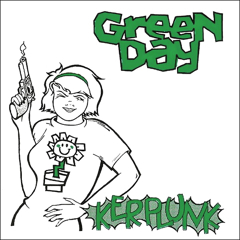 Even though Kerplunk is one of their least famous albums and was an independent, it is today cited as one of Green Day's greatest albums and the album that "introduced people to Green Day" with the songs 2000 Light Years Away and Welcome To Paradise. It was also a critical success. In December 2007, Blender magazine ranked Kerplunk! #47 on their list, "The 100 Greatest Indie Rock Albums Ever".